Scones for breakfast is probably one of my favorite things (food-wise). One of the problems I usually find with baking in the morning is that I wake up really hungry and the time it usually takes to prepare and bake is a real turn off for me. The beauty of these scones was that it was 1/2 hour from start to eating – that was fast enough even for me! These red and white scones are festive enough for New Years morning (or any other day). These scones tasted especially good spread with blueberry lime butter. It is my first experiment with using agave nectar for baking, I am pleasantly surprised by how well it turned out. In a large bowl, mix together the flour, baking powder and salt. Cut in the butter until the mixture resembles coarse crumbs. Stir in the chips and cranberries. In a smaller bowl, mix together the egg, agave nectar and milk. 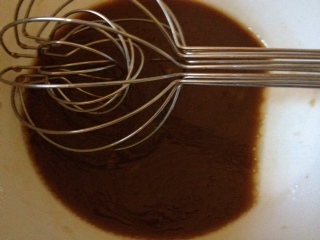 Stir the wet mixture into the dry until just moistened. Do not over-mix. Roll out the dough into a 1/2 inch thick circle. Cut into 8 wedges. Transfer to a baking sheet. Cook for 15 minutes, until golden brown. Who doesn’t love butternut squash? But I have to say that the squash that comes out of my garden is so much more flavorful that what you get in the store, there really is no comparison. If you can’t grow your own, try to get it from a farm market or farmer’s market, it will be worth your effort. I got this recipe from Iowa Girl Eats, the thought of using smoked cheddar drew me in. So I decided to try it when my macaroni and cheese aficionado (Lauren) was home. She gave it a definite thumbs up, including extra servings. In a large pot over medium heat, cook the squash in the milk until very tender, stirring occasionally. This will take a while, so be patient. About 30 minutes or more. Heat the oven to 425F. Coat a 9 x 13 pan with cooking spray. Stream in a slurry of the flour and cream into the milk. Cook for a few minutes, until the sauce is thick and luxurious. Remove from heat and stir in about 7 ounces of the cheese. Stir until creamy. Pour the noodles and squash-cheese sauce into a large bowl and mix together. Transfer to the baking dish. Top with remaining cheese and bread crumbs. Bake for 15 minutes. Serve and enjoy! Check out my guest blog on Spaghetti Squash with Honey & Feta on Rantings of an Amateur Chef. I am very excited about doing my first guest blog. 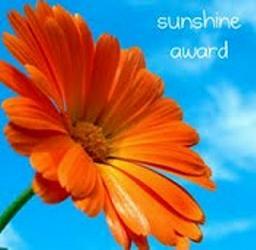 While you are there, check out the rest of Pat’s site, it is a fun one with lots of good recipes; it is one of the sites I regularly go to for ideas. My post is about using spaghetti squash from my garden – I still have a crate full of various squashes and sweet potatoes that I grew and will be using through the winter. So I guess we can call this the official turnover into the winter version of my blog – feeding my family with foods I have grown and have frozen or otherwise preserved to help my garden bounty last all year. Soon I will start planning what I will grow next year. Cammy has already put in his request for tomatoes, cucumbers, carrots and snap peas. After Thanksgiving, I was turkeyed out. It had been 5 straight days of turkey meat for this family that eats vegetarian over 80% of the time. There was one last 1-pound bag of turkey in the fridge, but I really did not want to eat turkey again. So, I wanted to make a dish I could freeze to serve later. Back to my slow cooker for some turkey chili. This dish can also be made with turkey you froze after Thanksgiving and are finally ready to revisit. I did taste it when I made it…I confess, not just a taste, I ate a small bowl… then into the freezer it went until we were ready to once again dig into some turkey. It came in handy during these hectic days, to be able to just pull it out, heat is up and …yum! Place all ingredients (not the toppings) in the slow cooker and mix well. Serve with assorted toppings. Enjoy! I just have to share this picture I took while I was out for my before-train walk this morning. It was a foggy morning, and the sun was just starting to break through as I walked along the Christina River. This is one of my favorite spots along the river, a little enclave with this statue and a bench tucked in between the path and the river. OK – on to the food…This is a dish I make when my tomatoes are coming in, but did not have the opportunity to post it this summer. If you want to make it now, you can use either canned or frozen tomatoes. I adapt Guy Fieri’s recipe to use turkey bacon, which makes it a bit more healthy. But this is a dish we eat because it is so darn good, even if it is not all that healthy. The trick is, we only eat it once in a blue moon, typically as a treat when Lauren is home from school. This version is adapted not only to the turkey bacon, but to the other ingredients I have in the house and the time of year (not summer). So I am using white onion – not red and dried basil from my garden – not fresh. Cook the bacon until crispy, drain on a paper towel and break into small pieces. Wipe out the pan used to cook the bacon, add the olive oil, onions and red pepper flakes. Cook until onions are translucent. Add garlic and basil, cook for 2 minutes. Add tomatoes. Saute for 5 minutes, then deglaze with wine. Drain pasta and add to the tomato mixture. Add bacon. Toss with parmesan and season to taste. Enjoy! Comfort food! Tuna kuku is a comfort food. It is one of those simple foods that just makes me feel good to eat. It starts with some good eggs (and Farmer Kim had brought by eggs over the weekend). When I saw the pouch of lemon pepper tuna in my pantry, I decided to build a kuku around it with shallots and scallions. I didn’t add any additional spices or seasonings since the lemon pepper tuna has all the seasoning needed. I made a small version for just my husband and me, but you can easily double everything in the recipe to serve 4. If you do, the cooking time may increase. Heat the oil in a nonstick skillet (that has a lid). Cook the shallots until lightly browned. In the meanwhile, beat the eggs until fluffy. Mix in the flour, scallions and tuna. Add the shallots and pour the mixture back into the skillet. Flip each piece and cook until lightly browned on that side, about 2 – 3 minutes. Serves 2 as a lunch or light dinner . I was not going to blog about these since I was only making them for the first time, but something told me to take pictures just in case. This is an adaptation of the recipe for “spanolatkes” from the restaurant Estia in Philadelphia. I found it in Food Network magazine and could not resist adding it to my “Latkemania.” Latkemania has included mushroom-noodle latkes, various combos of vegetable-potato latkes and will even include a gefilte-fish based latke before I am done (that one may just be weird, we will see). The concept of making a spanokapita latke was pretty irresistible, but what made this latke a ‘must do’ was that I was going to get to use some of the fall spinach from my garden in the recipe. Heat 1 1/2 Tbsp oil in a skillet (I used my cast iron skillet for all the cooking) over medium heat. Add the spinach and cook until wilted, 1 to 2 minutes. Transfer to a sieve set in a bowl; refrigerate until cold, about 15 minutes. Squeeze out any excess moisture and set aside. Meanwhile, add more safflower oil to the skillet to bring it mack to 1 12 Tbsp and heat over medium low heat. Add the leaks, sprinkle with 1/2 tsp salt and cook until soft, about 10 minutes. Add ths scallions and cook 3 to 4 more minutes. Add to spinach in sieve to let cool. Wash and grate the potatoes on the large holes of a box grater. Place in cheese cloth, wrap up and squeeze out the excess water. Place all the ingredients in a large bowl, including 1 tsp salt and 1/4 tsp pepper. Mix with you hands until well combined. 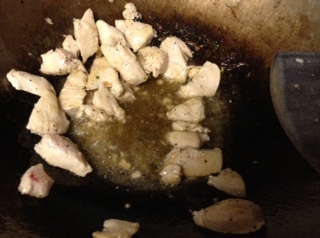 Wipe out the skillet and fill with 1/4 inch of safflower oil. Heat until 350F or until when you drop a piece of potato into the pan and it immediately starts sizzling. Work in batches, dropping 2 Tbsp of batter into the oil. Fry until golden brown and cooked through, about 2 to 3 minutes per side. Serve with yogurt or tzatziki. Enjoy! Cammy woke up wanting cookies. I don’t remember him ever asking for cookies, but today, that was what he wanted. Problem was, we did not have any cookies in the house, so we needed to make some. After a bit of debate (seems like everything with my 3 year old is a debate), he and I decided on triple chocolate chip cookies – basically traditional toll house cookie recipe from the Nestle’s bag with a mix of dark, semi-sweet and white chocolate chips and pieces. The eggs, as always, were from Farmer Kim. In a small bowl, mix together 2 1/4 cup flour with 1 tsp baking soda and 1 tsp salt. In a large bowl cream the butter with 3/4 cup white sugar, 3/4 cup brown sugar and 1 tsp vanilla. Add 2 eggs, one at a time, mixing in well after each. Add 1 3/4 cup mixed dark, semi-sweet and white chocolate pieces. Bake for 9-11 minutes. Cool on the cookie sheet for 2 minutes, then cool completely on a cookie rack. Makes 4 to 5 dozen. We made so many that we have enough to eat today, bring to school to share with his friends, and save for when his sisters come home from college, and maybe even some for Santa. As I have mentioned before, I have a tendency to become obsessed with cooking with one food or one type of food. So, for Hanukkah this year, my focus has become latkes. I have plans for different types of latkes every day – potato, sweet potato, spinach & feta, carrot & zucchini and various other vegetable combinations. Most will be experiments, if they are good, I will either share them at some point or maybe wait til next year to give myself a chance to perfect them. Line a sieve with cheese cloth. Place the potatoes in the cloth, squeeze out the excess moisture by wrapping the cloth aroun the potatoes and squeezing. Return the packet to the sieve and let drain for 15 minutes. In a bowl, mix together the shallots, chives, eggs, flour, salt and pepper. Add the potatoes and mix well to combine. Heat the 1/4″ of oil in a cast iron skillet (or large non-stick skillet). Drop the batter by tablespoonful into the oil. Cook until golden on each side – about 3 to 4 minutes per side. Serve with applesauce or sour cream. Or, serve it as dinner with some fried eggs…yum! Enjoy, L’Chaim! I love ramen noodles, but do not like the amount of sodium in packaged ramen. 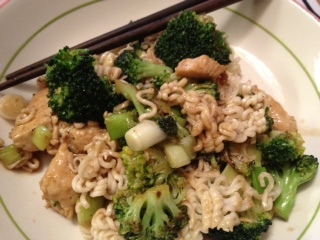 But the curly, twisty texture of the noodles is hard to resist. So, why not make it at home with my own sauce. Ramen, as a convenience food, feels like it should be a dish made with whatever is in the house. 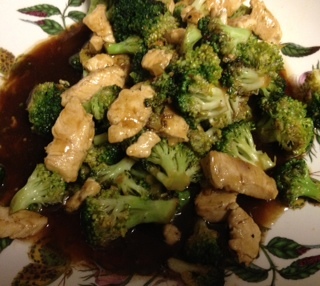 For us, this week, it is chicken breast, broccoli and scallions. But other veggies would work well, too – carrots, peas, string beans, etc. You could make this vegetarian or even use beef, if that is your preference. I apologize for not having more “in process” pictures, but once I started stir frying, I would have over-cooked things if I stopped to take pictures. Prepare the ramen according to package directions, or put in a bowl and cover with hot water, soak until softened, about 5 minutes. Drain. 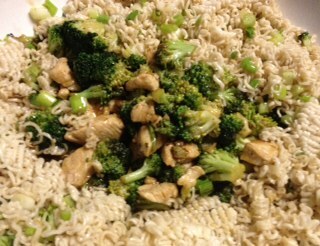 In a small bowl, stir together chicken broth, white wine, soy sauce, cornstarch, sugar, garlic powder and sesame oil. Set aside. In a wok or large skillet, heat 1 Tbsp vegetable in a wok until it is starting to smoke. Add the chicken and stir fry until just cooked. Do not over cook. Remove with a slotted spoon. Heat another Tbsp oil in the wok. Add the broccoli and stir fry until the broccoli starts to soften, about 1 – 2 minutes. Reduce the heat to medium and push the broccoli to the side. Add the ginger and cook til fragrant, about 30 seconds. 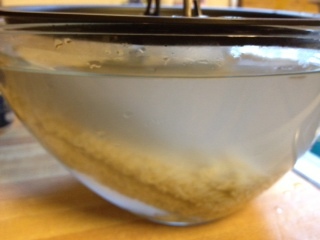 Add 1/4 cup water, stir and cook til mostly evaporated. Add the chicken broth mixture, bring it to a boil and cook, stirring occasionally, until thickened. This should take about 1 minute. Add the chicken and toss to coat. Transfer to a large serving bowl. Wipe out the wok and add 1 Tbsp oil, heat over medium-high heat. 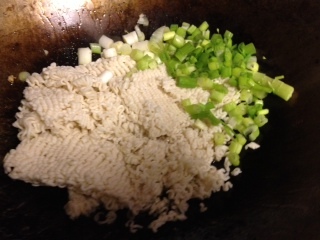 Add the ramen noodles and the scallions. Stir and cook til heated, about 1 – 2 minutes. Serve the noodles topped with the meat and vegetables. Enjoy.